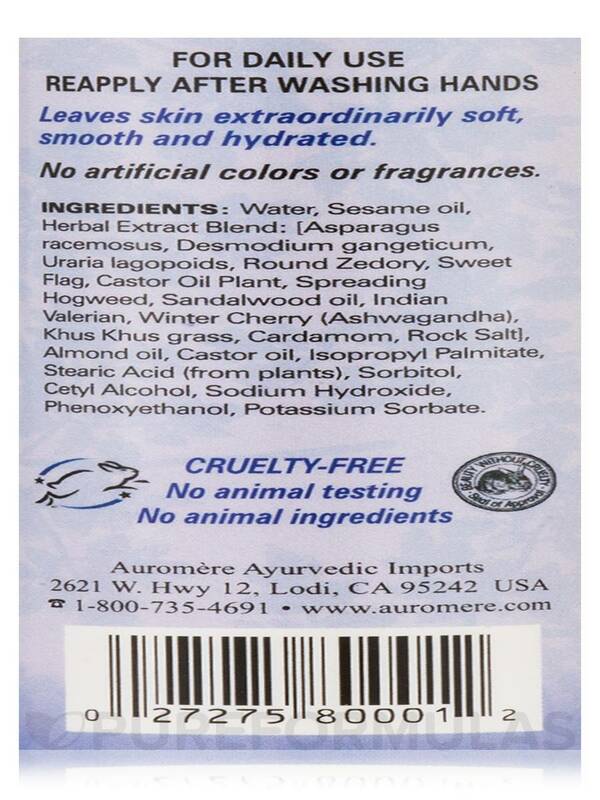 I like Ayurvedic Hand & Body Lotion by Auromere for a hand lotion, it's not greasy at all. I love that Ayurvedic Hand & Body Lotion by Auromere is meant for all three doshas. It is really relaxing and helps with a number of physical conditions. I have to try the massage oil from this brand next! Rejuvenating Hand & Body Lotion! Auromere Ayurvedic Hand & Body Lotion combines the deep-penetrating‚ nourishing properties of Sesame oil‚ the premiere ayurvedic oil for skin care‚ along with the moisturizing‚ soothing and rejuvenative action of Almond oil and castor oil. These cold-pressed oils are then infused with 13 ayurvedic herbal extracts traditionally prescribed for skin preservation‚ conditioning and muscle tone‚ and blended together in a gentle‚ hydrating lotion base. Water‚ Sesame oil‚ Herbal Extract Blend: Asparagus racemosus‚ Desmodium gangeticum‚ Uraria lagopoids‚ Round Zedory‚ Sweet Flag‚ Castor Oil Plant‚ Spreading Hogweed‚ Sandalwood Oil‚ Indian Valerian‚ Winter Cherry (Ashwagandha)‚ Khus Khus Grass‚ Cardamom‚ Rock Salt‚ Almond Oil‚ Castor Oil‚ Isopropyl Palmitate‚ Stearic Acid (from plant)‚ Sorbitol‚ Cetyl Alcohol‚ Phenoxyethanol‚ Potassium Sorbate. Cruelty-Free / No Animal testing / No Animal Ingredients. For daily use. Reapply after washing hands. Great lotion, especially for winter. 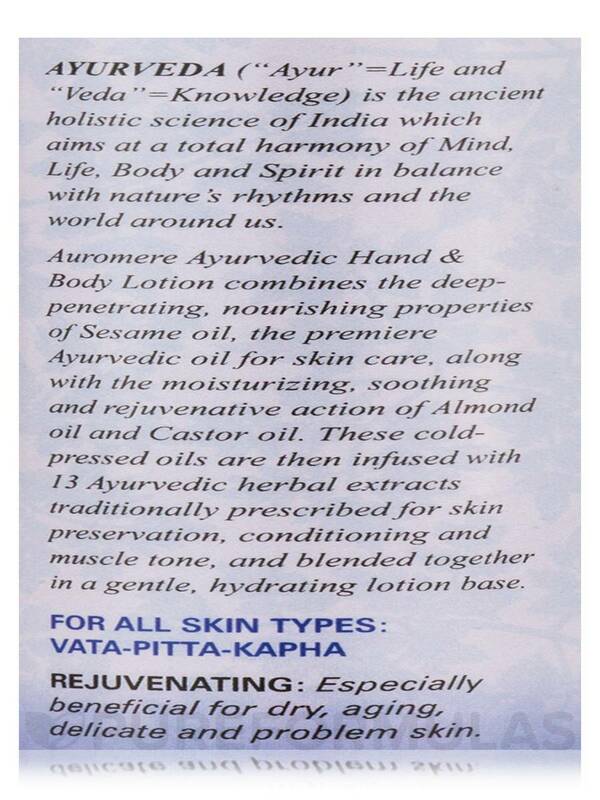 Ayurvedic Hand & Body Lotion by Auromere soothes skin and helps keep it moisturized. Absorbs well immediately and isn't greasy. I think the pleasant mild scent comes from the sesame, almond, and sandalwood oils. My hands always get bad cracks on the fingertips during winter. Since using this lotion, the cracks have healed faster, and I notice I get far fewer new cracks. None of the cracks bleed or hurt a lot like before. This stuff is excellent. I also like Auromere's soaps. 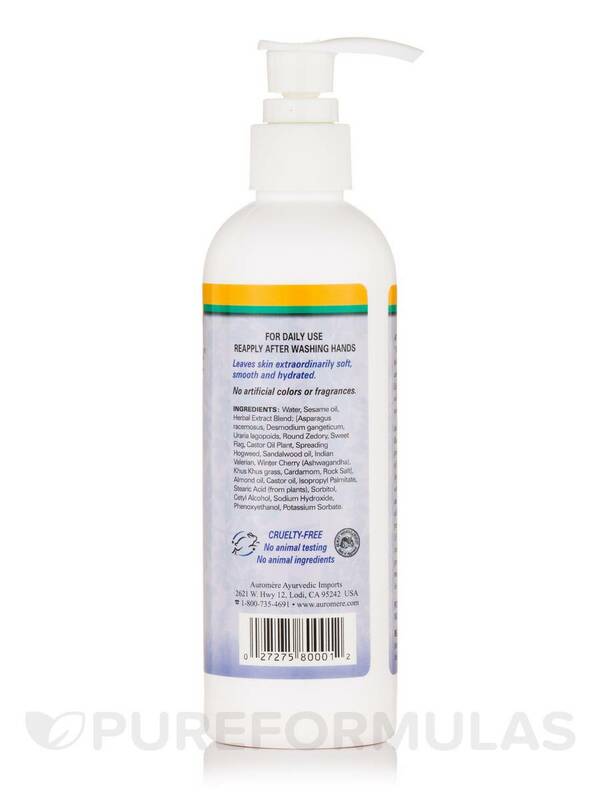 Works really well, no animal testing or animal ingredients, good combination of herbal ingredients, reasonable price, handy pump on bottle, fast shipping, packed with care, and super fresh from PureFormulas. A big bottle, great value. I just didn't like Ayurvedic Hand & Body Lotion by Auromere because it was too watery and greasy. I still used it everyday until the last drop but it didn't make my skin feel better at all. The fragrance also, could have been better. 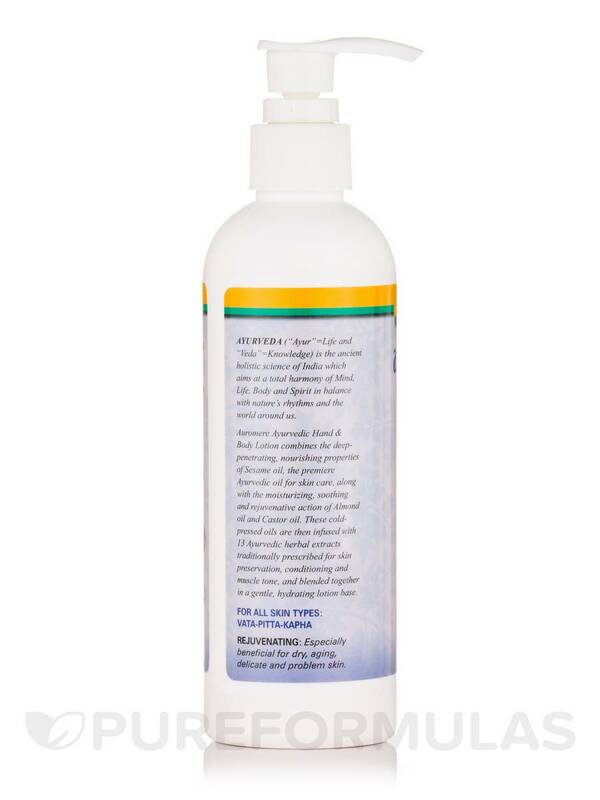 The Ayurvedic Hand & Body Lotion by Auromere is a thin consistency lotion. I like that it moisturizes well and absorbs into my skin. 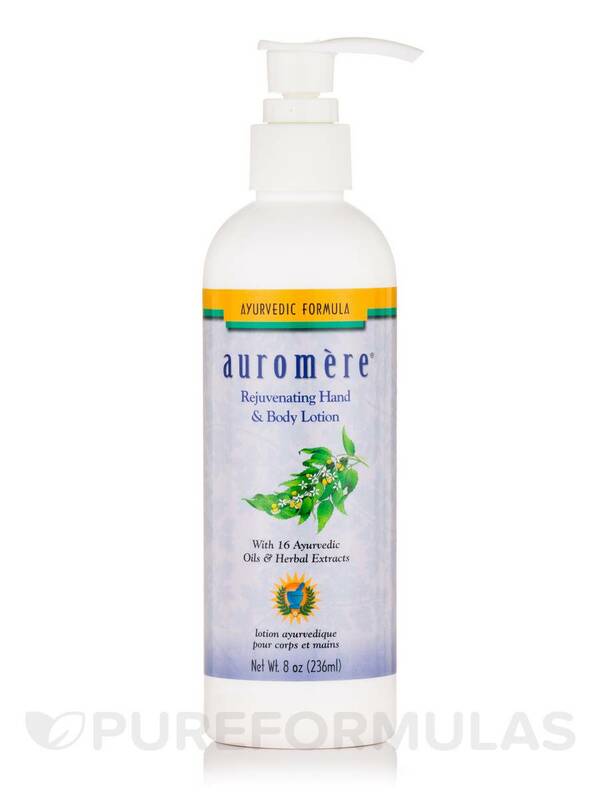 Ayurvedic Hand & Body Lotion by Auromere is an awesome and inexpensive lotion. In Colorado, it doesn't keep my skin as moisturized as I would need, but that's because I like in the mile high city and already have dry skin. I like putting it on my hands at night and wearing soft gloves to lock in the moisture. For humid climates this would be perfect. I keep this in my bathroom for guests and I feel really hospitable by doing so. Inexpensive good ingredients nice scent. I'm really enjoying Ayurvedic Hand & Body Lotion by Auromere it has quite a strong scent but it doesn't linger too long and it absorbs fairly quickly when you put it on not too oily. For the size of the bottle it is excellent value for money. Ayurvedic Hand & Body Lotion by Auromere is amazing! It's all natural choice for me and I am very happy with this brand overall I use many of their products and each product is unique and of highest quality. I love the scent, moisture retaining, and consistency of Ayurvedic Hand & Body Lotion by Auromere. Absorbs fast and helps dryness quickly. The massage oil has the same scent. The only downfall is the bottle needs to be much bigger. Using it daily it may last a week and a half. Needs to be sold in a larger size. Ayurvedic Hand & Body by Auromere is a very light, clean lotion. I wouldn't recommend it if you have super dry or cracked skin, it's not designed to do that. However, if you are looking for a lotion to maintain or seal the oils you put on your body then this is it! I love that there are such high quality oils such as sandalwood almond and castor. It also has herbs such as sweet flag spreading hog weed and winter cherry. Too light for dry skin.